, the second of the name, and the eldest son of Robert, was born at Paris in 1528, and froiii his inf-mcy gave every promise of perpetuating the honours of the family. His tatuer, uoi having it in his power to superintend his education as he wished, entrusted that care to an able tutor, who was to instruct him in the elements of grammar. At this time his tutor, in his ordinary course, was teaching his other pupils the Medea of Euripides, and Henry was bo captivated with the sweetness and harmony of the Greek language, that he resolved immediately to learn it. 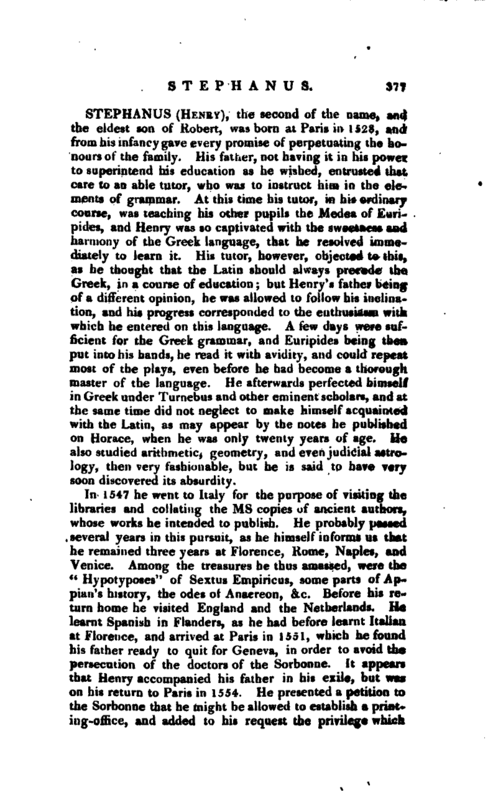 His tutor, however, objected to this, as he thought that the Latin should always precede the Greek, in a course of education; but Henry’s father being of a different opinion, he was allowed to foilow his inclination, and his progress corresponded to the enthusiasm with which he entire < on this language. A few days were sufficient for the Greek grammar, and Euripides being then put into his hands, he read it with avidity, and could repeat most of the plays, even before he had become a thorough master of the language. He afterwards perfected himself in Greek under Turnebus and other eminent scholars, and at the same time did not neglect to make himself acquainted with the Latin, as may appear by the notes he published on Horace, when he was only twenty years of age. He also studied arithmetic, geometry, and even judicial astrology, then very fashionable, but he is said to have very soon discovered its absurdity. In 1547 he went to Italy for the purpose of visiting the libraries and collating the ms copies of ancient authors, whose works he intended to publish. He probably passed several years in this pursuit, as he himself informs us that he remained three years at Florence, Rome, Naples, and Venice. Among the treasures he thus amassed, were the “Hypotyposes” of Sextus Empiricus, some parts ofAppian’s history, the odes of Anacreon, &c. Before his return home he visited England and the Netherlands. He learnt Spanish in Flanders, as he had before learnt Italian at Florence, and arrived at Paris in 1551, which he found his father ready to quit for Geneva, in order to avoid the persecution of the doctors of the Sorbonne. It appears that Henry accompanied his father in his exile, but was on his return to Paris in 1554. 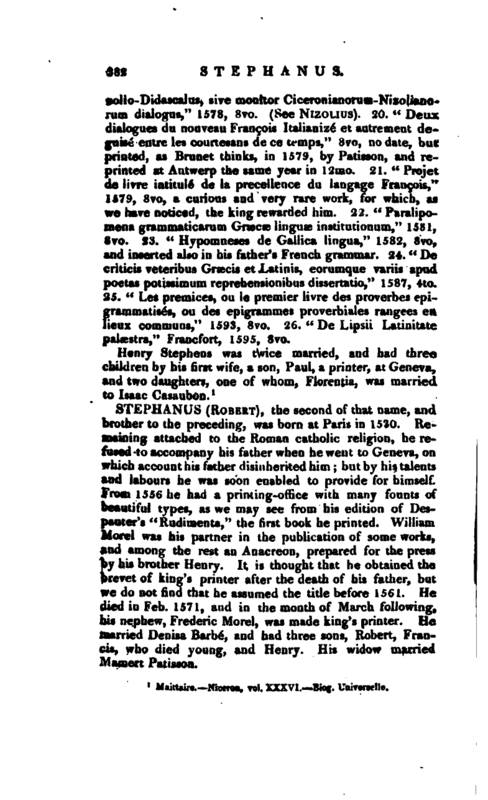 He presented a petition to the Sorbonne that he might be allowed to establish a printing-office, and added to his request the privilege which | Francis I. had granted to his father, and soon after published his edition of Anacreon; at least this bears his name, but some suppose it was printed in the house of Charles Stephens, and that Henry had not an establishment of his own before 1557. Towards the end of 1554 he was at Rome, and went thence to Naples to endeavour to obtain those passports which the French ambassador, Odet de Selves, demanded of him, and it is said that he escaped an ignominious death by his facility in speaking Italian. He then went to Venice, to collate some valuable Mss. of Xenophon and Diogenes Laertius. It was therefore about the beginning of 1557 that he published some of those works which he had obtained with so much pains and risk. The great expences he had incurred, would at this time have ruined him, if Ulrick Fugger, an opulent patron of literature, had not advanced him the money necessary to carry on the business. Henry, out of gratitude, took the title of printer to this benefactor, “Illustris viri Huldnci Fuggeri typographic,” which he continued as long as the latter lived. In 1559 his father died, which appears to have thrown him into melancholy, which his friends did every thing in their power to dissipate, and among other schemes recommended him to marry. He accordingly married a lady of the family of Schrimger, whom he often praises for the sweetness of her disposition. His health and tranquillity being now restored, he applied himself to business with his usual activity. His father had appointed him his executor, and recommended the care of his brothers, which appears to have been attended with some trouble and vexation. Another source of trouble arose from his having made a public profession of his adherence to the reformed religion. 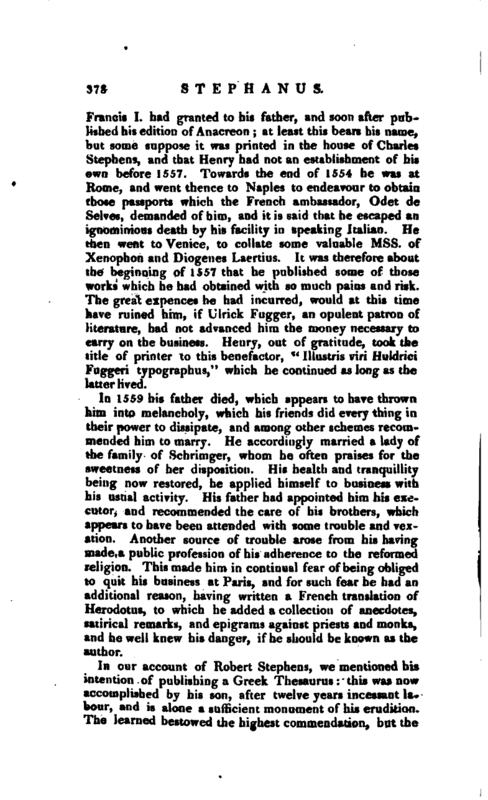 This made him in continual fear of being obliged to quit his business at Paris, and for such fear he had an additional reason, having written a French translation of Herodotus, to which he added a collection of anecdotes, satirical remarks, and epigrams against priests and monks, and he well knew his danger, if he should be known as the author. 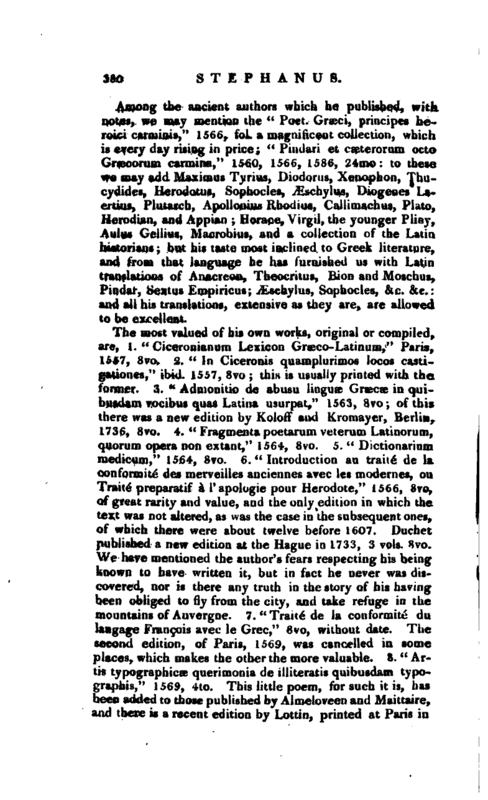 In our account of Robert Stephens, we mentioned his intention of publishing a Greek Thesaurus: this was now accomplished by his son, after twelve years incessant labour, and is alone a sufficient monument of his erudition. The learned bestowed the highest commendation, but the | great price which he was obliged to fix upon it to indemnify himself is said to have retarded the sale, and he was still a more serious sufferer by the plagiarism of Scapula (See Scapula), which indeed completed his ruin. He was not, however, without friends or resources. He went after this affair into Germany, and although he had been neglected by his countrymen, did not cease by his writings to do honour to France in foreign countries. This conduct recommended him to the favour of Henry III. 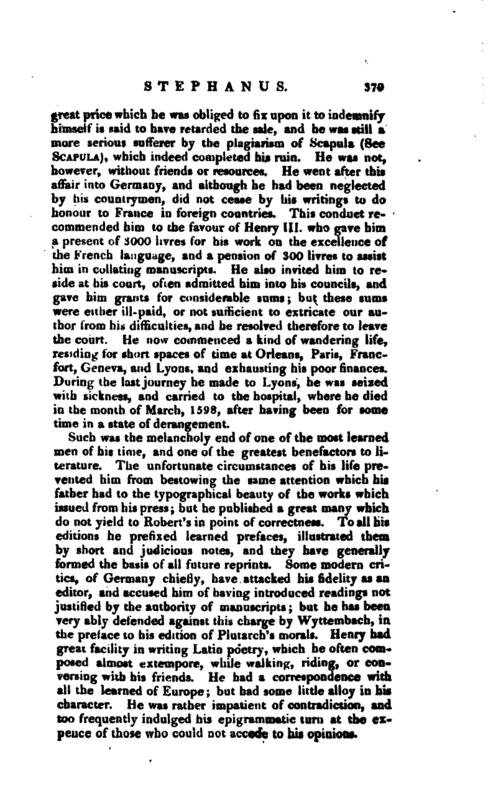 who gave him a present of 3000 livres for his work on the excellence of the French language, and a pension of 300 livres to assist him in collating manuscripts. He also invited him to reside at his court, often admitted him into his councils, and gave him grants for considerable sums; but these sums were either ill-paid, or not sufficient to extricate our author from his difficulties, and he resolved therefore to leave the court. He now commenced a kind of wandering life, residing for short spaces of time at Orleans, Paris, Francfort, Geneva, and Lyons, and exhausting his poor finances. During the last journey he made to Lyons, he was seized with sickness, and carried to the hospital, where he died in the month of March, 1598, after having been for some time in a state of derangement. Such was the melancholy end of one of the most learned men of his time, and one of the greatest benefactors to literature. The unfortunate circumstances of his life prevented him from bestowing the same attention which his father had to the typographical beauty of the works which issued from his press; but he published a great many which do not yield to Robert’s in point of correctness. To all his editions he prefixed learned prefaces, illustrated them by short and judicious notes, and they have generally formed the basis of all future reprints. Some modern critics, of Germany chiefly, have attacked his fidelity as an editor, and accused him of having introduced readings not justified by the authority of manuscripts; but he has been very ably defended against this charge by Wyttembach, in the preface to his edition of Plutarch’s morals. Henry had great facility in writing Latin poetry, which he often composed almost extempore, while walking, riding, or conversing with his friends. He had a correspondence with all the learned of Europe; but had seme little alloy in his character. He was rather impatient of contradiction, and too frequently indulged his epigrammatic turn at the expence of those who could not accede to his opinions. | Among the ancient authors which he published, with notes, we may mention the “Poet. Gracci, principes heroici carminis,” 1566, fol. a magnificent collection, which is every day rising in price; “Pindari et casterorum octo Grfficorum carmina,” 1560, 1566, 1586, 24mo: to these we may add Maximus Tyrius, Diodorus, Xenophon, Thucydides, Hefodotus, Sophocles, ^schylus, Diogenes Laertius, Plutarch, Apollonius Rhotlius, Callimachus, Plato, Herodian, and Appian; Horace, Virgil, the younger Pliny, Aulus Gellius, Macrobius, and a collection of the Latin historians; but his taste most inclined to Greek literature, and from that language he has furnished us with Latin translations of Anacreon, Theocritus, Bion and Moschus, Pindar, Sextus Empiricus; Æschylus, Sophocles, &c. &e. and all his translations, extensive as they are, are allowed to be excellent. The most valued of his own works, original or compiled, are, 1. “Ciceronianum Lexicon Graeco-Latinum,” Paris, 1557, 8vo. 2. “In Ciceronis quamplurimos locos castigationes,” ibid. 1557, 8vo; this is usually printed with th former. 3. “Admonitio de abusu linguae Graecae in quibusdam vocibus quas Latina usurpat,” 1563, 8vo; of this there was a new edition by Koloff and Kromayer, Berlin, 1736, 8vo. 4. “Fragmenta poetarum veterum Latinorum, quorum opera non extant,” 1564, 8vo. 5. “Dictionarium medicum,” 1564, 8vo. 6. “Introduction au traite de la conformite des merveilles anciennes avec les modernes, ou Traite preparatif a l’apologie pour Herodote,” 1566, 8vo, of great rarity and value, and the only edition in which the text was not altered, as was the case in the subsequent ones, of which there were about twelve before 1607. Duchet published a new edition at the Hague in 1733, 3 vols. 8vo. We have mentioned the author’s fears respecting his being known to have written it, but in fact he never was discovered, nor is there any truth in the story of his having been obliged to fly from the city, and take refuge in the mountains of Auvergne. 7. “Traite de la conformite du langage Francois avec le Grec,” 8vo, without date. The second edition, of Paris, 1569, was cancelled in some places, which makes the other the more valuable. 8. “Artis typographicae querimonia de illiteratis quibusdam typographis,” 1569, 4to. This little poem, for such it is, has been added to those published by Almeloveen and Maittaire, and there is a recent edition by Lottin, printed at Paris in | 1785, 4to, with a French translation, and the genealogy of the Stephani, from 1500. 9. “Epistola qua ad multas multorum amicorum respondet de suas typographic statu, nominatimque de suo Thesauro linguae Graecoe,” 1569, 8vo, reprinted also by Almeloveen and Maittaire. 10. “Comicoruin Graecorum sententiae,” 1569, 12mo. 11. “Epigrammata Graeca selectaex Anthologia interpretata ad verbum et carmina,” 1570, 8vo. 12. “Thesaurus Grsecae linguae,” 1572, 4 vols. fol. with which is connected the “Glossariaduo,” &C.1573, fol. Of this celebrated work it is unnecessary to say much, as it is so well known to the learned in Europe, and to others information vvoxild be unnecessary. Maittaire was of opinion that Henry published a second edition, but has not discovered the date. Niceron thinks he only printed a new title for the unsold copies, with an epigram on Scapula. But Brunet, after examining a great many copies, both with the first and second titles, inclines to the existence of a second edition. Of late a spirited invitation has been held out to public taste and liberality by Messrs. Valpy, who have undertaken a nevr edition, with improvements and every lover of literature, every scholar anxious for the honour of his country must wish them success. 13. “Virtutum encomia, sive gnomas de virtutibus,” 1575, 12mo. 14. “Francofordiense emporium, sive Francofordienses nundinse,” 1574, 8vo. This collection of prose and verse pieces, which he calls “merchandize,” is but little known. 15. “Discours merveilleux de la vie et deportments de la reine Catherine de Medecis,” 1575, 8vo. This satire, translated in 1575, by a protestant writer, into Latin, with the title of “Legenda sanctae Catharinae JMediceas,” is attributed to Henry Stephens, and has been often reprinted. 16. “De Latinitate falso suspecta expostulatio, necnon de Plauti Latinitate dissertatio,” 1576, 8vo. This is a hit at the Ciceronians, or those who undervalue all Latin that is not borrowed from Cicero. 17. “Pseudo-Cicero, dialogus in quo de multis ad Ciceronis sermonem pertinentibus, de delectu editionum ejus, et cautione in eo legendo,” 1577, 8vo. 18. “Schediasmatum variorum, id est, observationum, &c. libri tres,” 1578, 8vo. These three books of critical remarks bear the names of the first three months of the year, and three others were added in 1589, but this second part is very rare. Gruter, however, has inserted it in the supplement to vol. 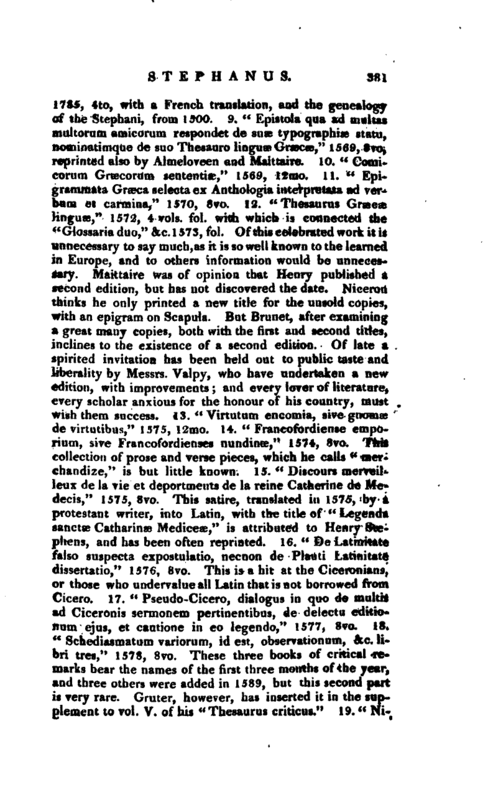 V. of his “Thesaurus criticus.” 19. “| Nizolio-Didascalus, sive monitor Ciceronianorum-Nizoliandrum dialogus,” 1578, 8vo. (See Nizolius). 20. “Deux dialogues du nouveau Frangois Italianize” et autrement deguise entre les courtesans de ce temps,“3vo, no date, but printed, as Brunet thinks, in 1579, by Patisson, and reprinted at Antwerp the same year in 12mo. 21.” Projet de livre intitule de la precellence du langage Frangois,“1579, 8vo, a curious and very rare work, for which, as we have noticed, the king rewarded him. 22.” Paralipojnena grammaticarum GrEecae linguae institutionum,“1581, 8vo. 23.” Hypomneses de Gallica lingua,“1582, 8vo, and inserted also in his father’s French grammar. 24.” De criticis veteribus Grsecis et Latinis, eorumque variis apud poetas potissimurn reprehensionibus dissertatio,“1587, 4to. 25.” Les premices, ou le premier livre des proverbes epigrammatises, ou des epigrammes proverbiales rangees ea lieux communs,“1593, 8vo. 26.” De Lipsii Latinitate palestra," Francfort, 1595, 8vo.